Two notable composers and virtuosos musicians meet on stage for the first time for two Sunday performances only, in the “Kremlino” Music Scene in Piraeus, on February 5 and 12. The expert on the retro era -and not only- Thanos Polydoras, the impressive singer & actress Politimi and the upcoming Pelagia. Young artists who make us crazy with doodles and their amazing performances on stage. On February 5th, the riveting Yakinthi Lagiou and the explosive soprano Kassandra Dimopoulou and on the12th, the talented Nicol Saravakou. The eyes are “trapped” by Alice Mavroidi & Elena Linardaki to their excellent choreographies in Tango, Swing, Waltz, Cha-cha-chá, & Gipsy-Balkan rhythms, combined with video projections. The final outcome is completed by an excellent music ensemble. 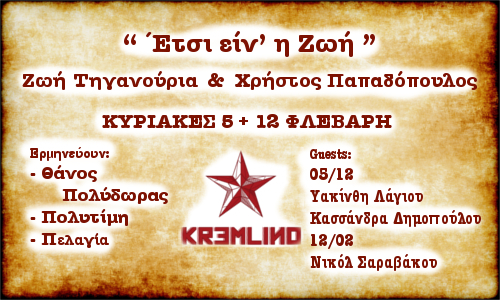 In “Kremlino” Music Scene in Piraeus, on February 5 and 12.